BitLife – Life Simulator Dental School – How To Become A Dentist? Becoming a dentist in BitLife – Life Simulator is one of the 63 challenges. To become a dentist, you will have to graduate from dental school. After that, you can apply for the dentist job. If your application for Dental School admission is kept rejecting, then our today’s post will guide you with this walkthrough! (TL; dr Walkthrough – To accomplish this objective, you will have to graduate in Biology from the college. After that, you will be able to apply for dental school. There are some things you need to take care of while studying or progressing). Let’s get started: BitLife – Life SImulator Dental School – How to become a dentist? ⇒The very first thing you need to check is the virtual character’s stats. When you start a new life, the game chooses a random character(country, parents, financial position). At the bottom section of the screen, you can check the character’s stats. If the character is not smart, we would recommend you to start over. Tap the menu button -> start a new life. It would be better to continue with the character having more than 85 points in smartness. ⇒At the age of 6, your primary education stats. To maintain the smart stats, make sure to study hard every year. Tap the school button -> study harder. You have to do it every year. Additionally, after a few years(In high school), you will be able to access the library activity. Tap the activities button -> library -> visit the library every year. ⇒After graduation from high school, the player has to choose a career in education. Since you want to become a dentist, go for biology. 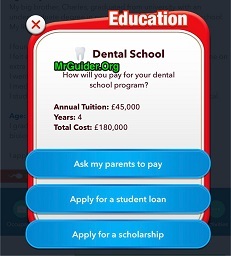 It is one of the main steps to get into dental school in BitLife – Life Simulator. ⇒After choosing biology as the main subject, you can apply for dental school. But, make sure to study hard every year while studying in college. Your application may get rejected even after choosing biology as the main subject. To avoid this problem, study hard every year -> visit the library every year and keep the virtual character smart. 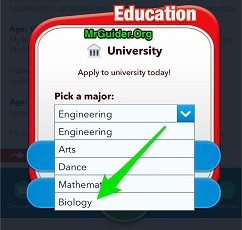 After graduating in biology from university, the game will give you three options; seek higher education, look for a job, and take some rest. Choose to seek higher education and apply for dental school. If you worked hard, visited the library in the early years(every year), you will get into the dental school! Study hard every year + visit library every year while studying in the dental school. After graduating from dental school, look for a job -> apply for a dentist job! That’s it! You are now a dentist. 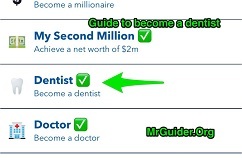 So this is the complete BitLife – Life Simulator walkthrough guide to becoming a dentist, get into the dental school. If you know any other way, comment below!